• and lots of other products and services. that will help you sell more to your customers. We feature articles from the experts in many fields, including informational material that you can share with your customers to help you sell more. Our articles also tell you about products, like oils, ritual materials, crystal bowls, healing tools and much more, including some of the newest products that appeal to metaphysical customers. Plus, we feature marketing and display ideas, show tips, and business information. Our advertisers are high quality vendors, often the direct source of an item, or the manufacturer of a product. Many of our mineral suppliers are from around the world, and you won’t find them in any other magazine. We are a great place to find sources for wholesale crystals and minerals. • In September, the Fall Buyers Guide offers new catalog and wholesale suppliers (many online) just in time for your holiday inventory needs. The articles target gift marketing, and tips for marketing jewelry, gemstones and other products for the holidays. 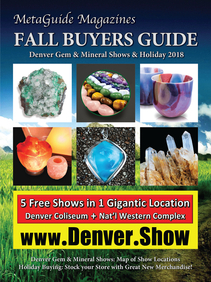 If you attend the Denver Gem and Mineral shows, it will also help you navigate to find special suppliers. 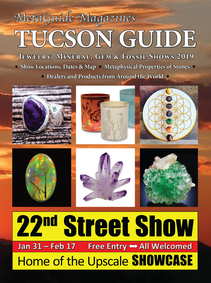 • In January, the Tucson MetaGuide to Jewelry, Mineral, Gem and Fossil Shows helps you find your favorite metaphysical vendors so you don’t miss anyone on your buying trip. It also showcases new vendors to call and visit online, and features articles about important minerals, stones, and other products that your customers want. This issue is also available online two weeks before the Tucson Show. If you attend the February Tucson shows, you can pick up one of the 35,000 print copies distributed at the various shows. • Vendor Information: Links to advertiser’s websites or contact information. • Archived issues of the MetaGuide Magazines. • The latest Issues are online prior to the Denver and Tucson show openings to use in your show shopping planning. • NEW Interactive online digital issues starting with the 2013 Fall Buyers Guide.